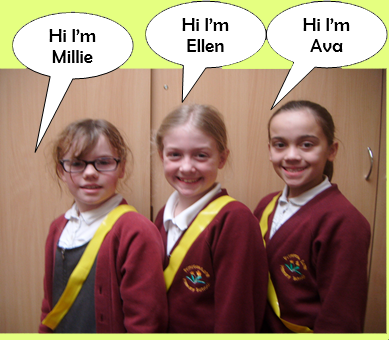 On Wednesday 3rd February, twelve of our Year 5 children were invited, as ambassadors of our school, to take part in an exciting opportunity held at Boston Spa School. 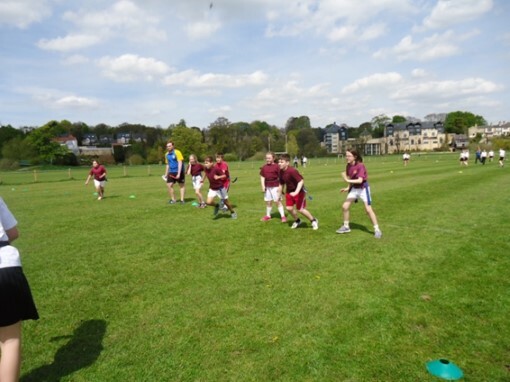 All twelve had applied to become ‘Sports Leaders’ in a vigorous process with PE and Sport Coordinator, Mr Jackson. 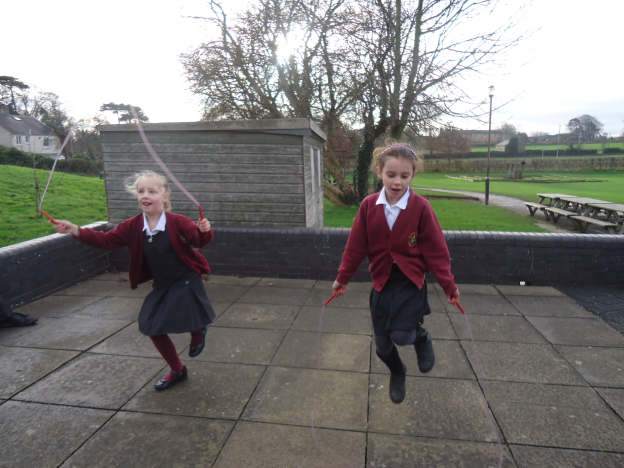 The objective of the day on 3rd February, was to develop the children’s leadership skills, which are all core skills throughout life and transferable back into the playground. 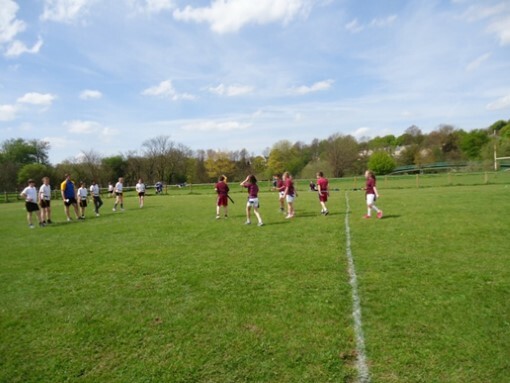 ‘I enjoyed the Sports Leadership day because I learnt new skills, I learnt new ways to communicate with everyone as well as new ways to get into groups.’ Isobel. 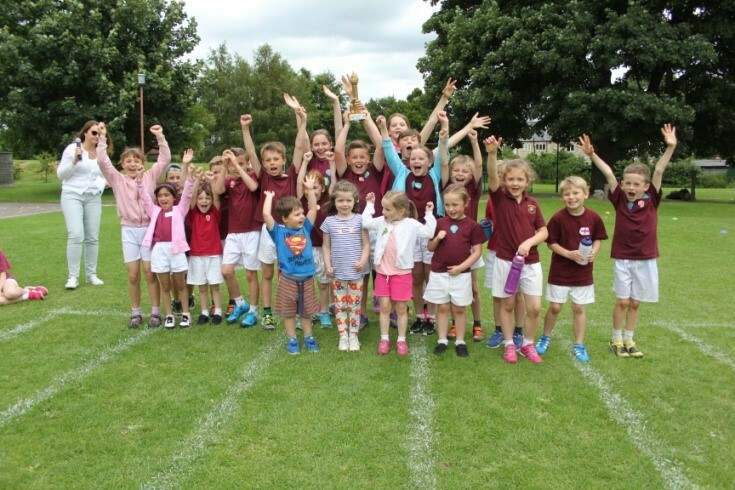 On Tuesday 12th July 2016, Primrose Lane had their annual sports day, which comprised of various sporting activities, where all children competed within their country and tried to score as many points as they could in order to win the trophy. 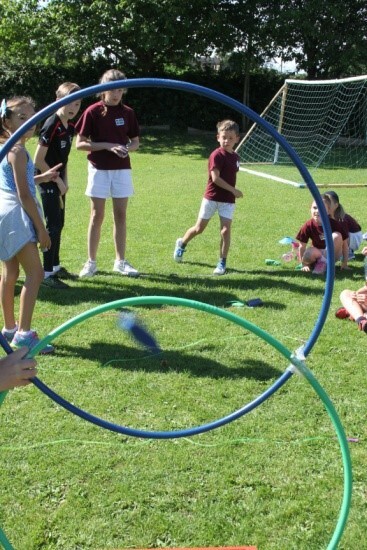 Within the morning events, children from all year groups were assigned to a country (with our chosen focus this year within the Euro 2016 countries) and the Year 5 children led the sporting activities that the countries moved around. 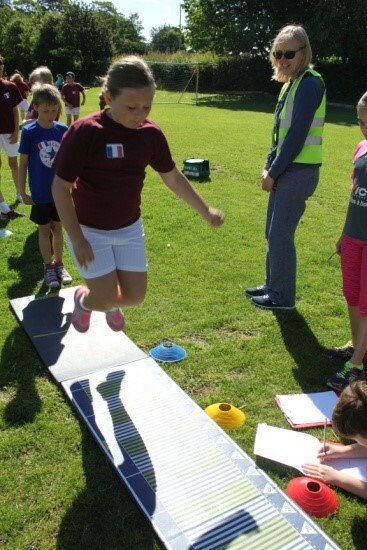 Year 5 have been busy planning the morning events and used their leadership skills in informing the groups how to compete most effectively and safely, tally the scores up, as well as coordinate the children to their next event. We finished with announcing the results from the morning for the winning country to collect their trophy, and the winners were…England! 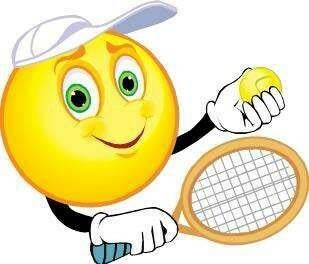 Thank you to all children for competing well, trying their best, behaving well and achieving. 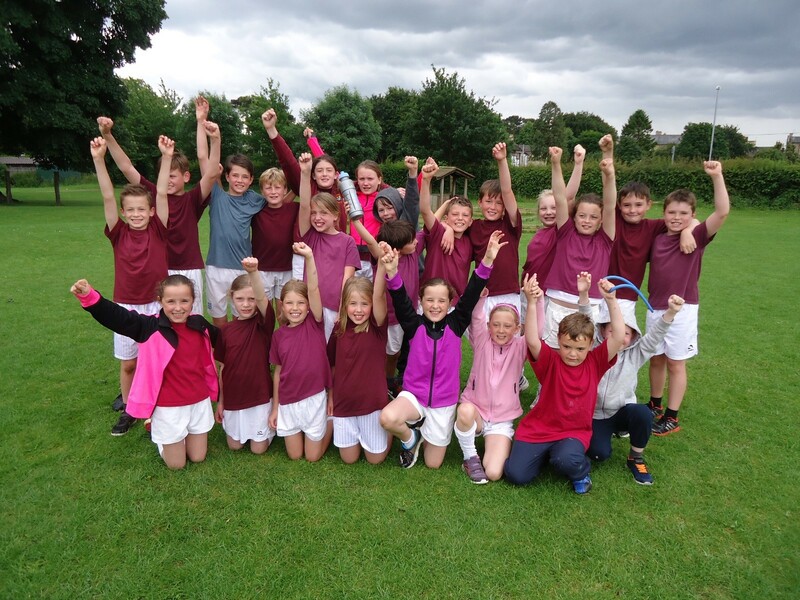 On Friday 1st July 2016, KS2 had a Gems Rounders Competition, whereby each Gem group (From Emerald, Sapphire, Ruby, Amber and Amethyst) played each other in order to be crowned the Gem winners! 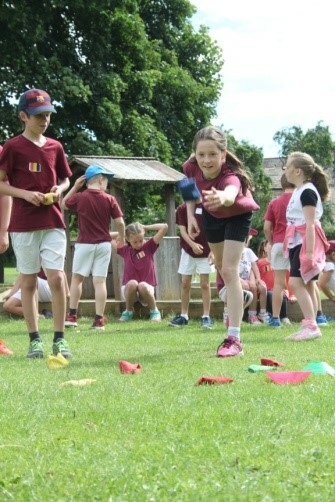 The preliminary rounds were very exciting, with all teams scoring some great rounders, making good catches and fielding like they were pro’s! Following a morning of fierce competition, the scores were added up. Amber, Amethyst and Emerald all had 5 points so it came down to rounders scored. Having scored 9 rounders, Amber progressed straight through to the final, leaving Amethyst and Emerald to play off against each other. It was a tight game with both Amethyst and Emerald giving their all but Amethyst progressed to the final scoring 3 rounders to Emeralds 2. We then had an equally enthralling final, with Amber playing Amethyst to be crowned the winner. Amber were first to bat, although they played well they were unable to score a rounder so Amethyst needed just one rounder to win. 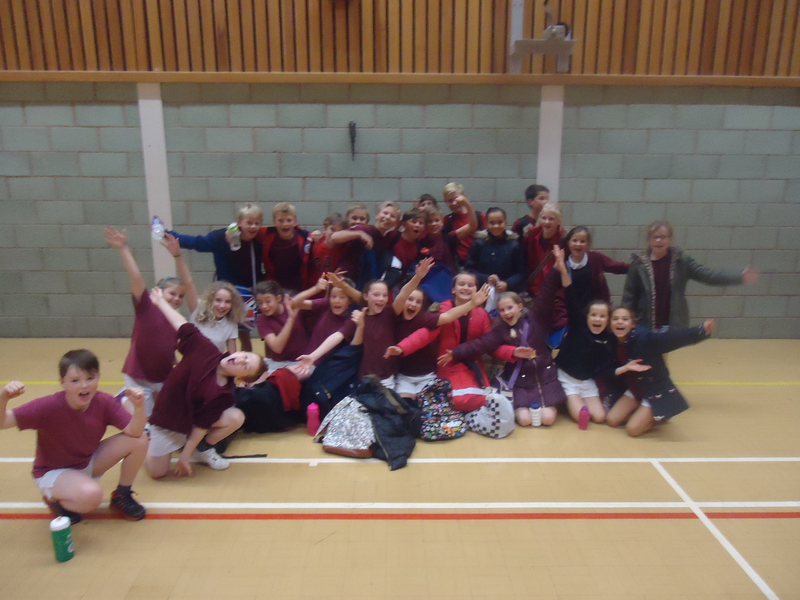 As the winning rounder was scored, Amethyst cheered and celebrated their win. 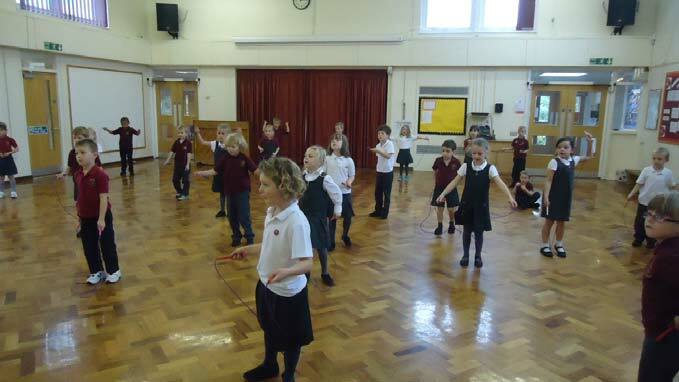 On Monday Year Two took part in the Skipping Festival. 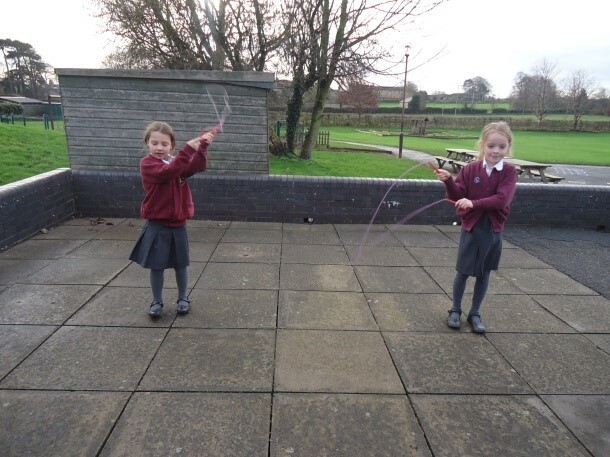 All the children have spent time in PE and at playtimes practising various skipping skills and were excited to compete. 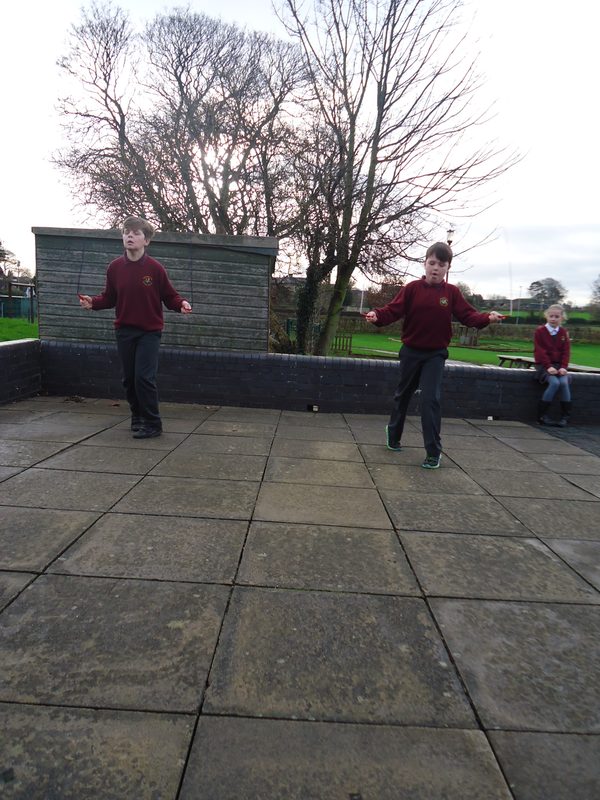 There were individual skips, partner skips and group skips. All the children tried their best and had a great time participating. Although we did not win overall some children did win individual certificates so an extra special well done to them! Jonathan – Yesterday when we went to the East Leeds Skipping Final I was nervous but when we got there I was fine. When we did the 1 minute challenge I did it fine but when we did the 2 minute challenge I got a stitch. 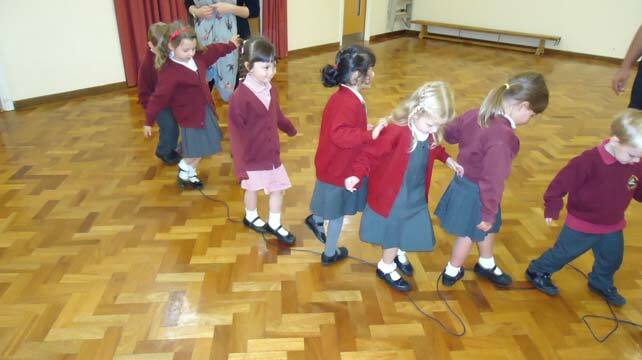 When we did our skip dance it was so fun. I really enjoyed it. 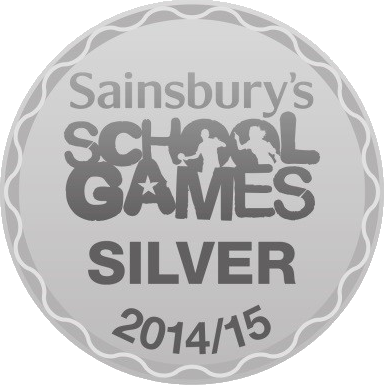 Then we did Run-Jump-Out and our school got bronze. 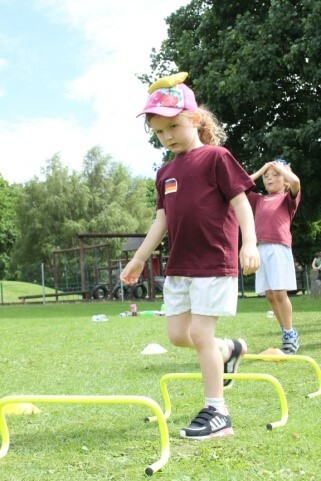 Leah – I was proud of myself in Run-Jump-Out. Luke A – I really enjoyed the Skipping Festival and my favourite part was when I achieved gold on the Pretzel. We got runner up for the whole thing. I hope we get in the final next year. Imogen – It was fantastic! I was so happy. In the Face to Face event, with Anya, I came 1st! We were amazed! It was great! Ava –My favourite part was when they handed out the certificates. I got gold for Butterfly and gold for Keep the Pot Boling. Sadly, we didn’t win, but it was still great. 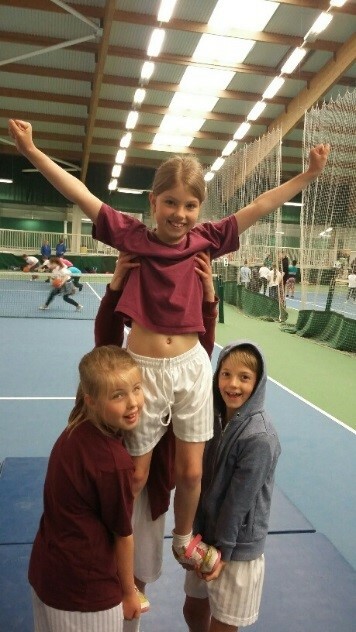 Rosie –Ava and I were doing the Butterfly and we got joint gold (1st). I was really scared because I thought we didn’t do very well. 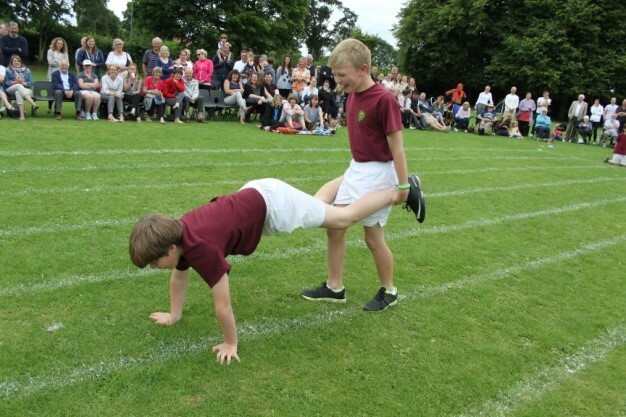 Zak –I really enjoyed doing the skip dance because we came second out of thirty schools which was a great achievement. 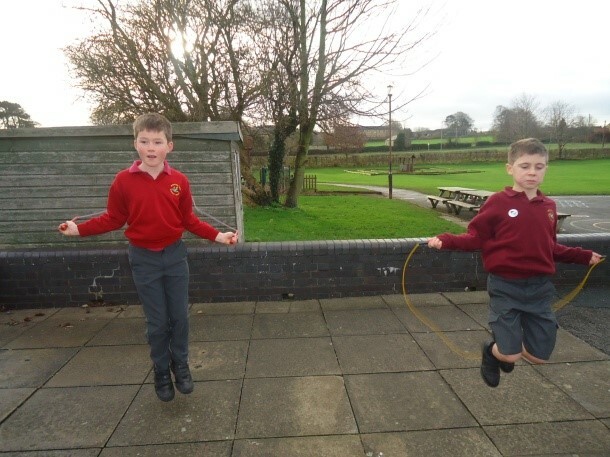 Ethan – I really enjoyed the skipping competition because Keep the Pot Boiling got gold but in our first competition we got silver. 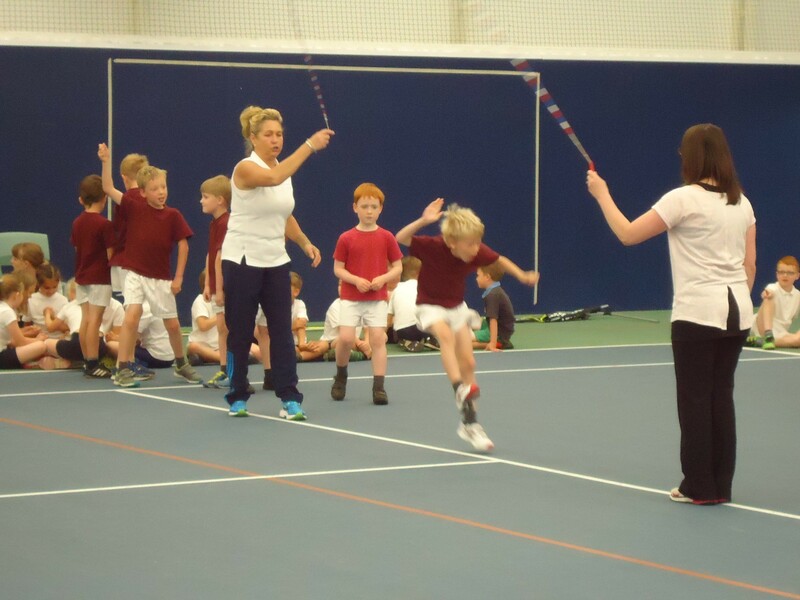 Anya – Year 4 were at the East Leeds Skipping Completion Final. We were against Kippax Greenfield, Thorner, East Garforth and Temple Newsam. 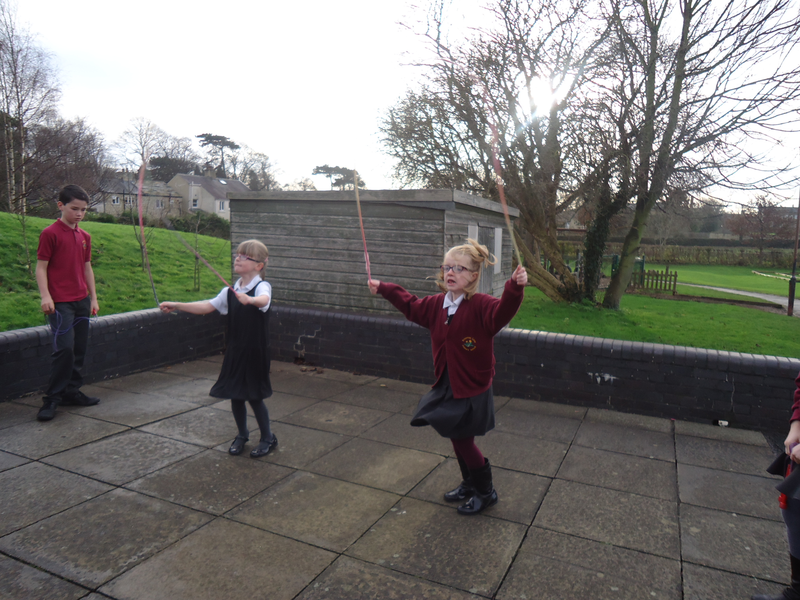 Unfortunately, we didn’t win but that was ok.
Ashlynne – I really enjoyed our Skipping Festival because we all did our best and it was fun. Joe – At the skipping completion, we came 2nd which I was very pleased with, it would have been even better if we came first but at least it is better than coming last! The behaviour of the class was fantastic, Mrs McTaggart (and all the other adults) were really proud of them. All children successfully passed and achieved their certificates and badges, loving the experience in the process! 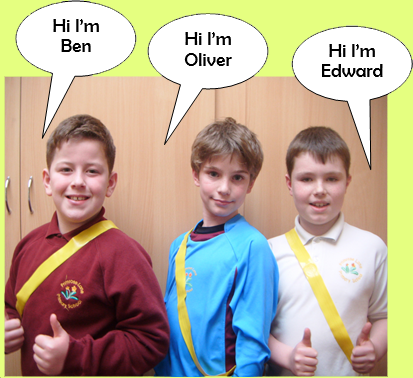 The class would like to thank the instructors very much for their help (Mrs Gaunt, Chris). 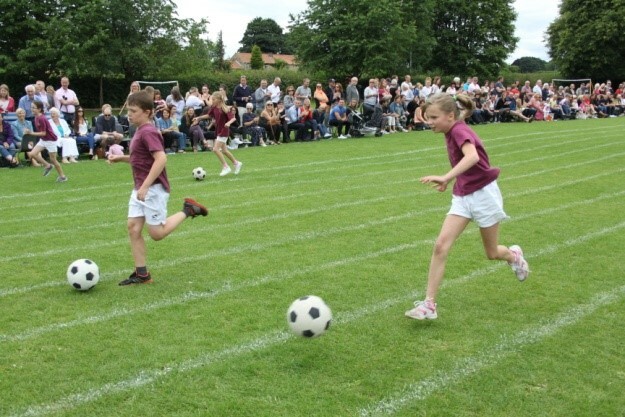 On Saturday the 11th of June, Primrose Lane Primary school took place in the Boston Spa Football Gala. At first, our three teams got separated into two group stages, which if they qualified for, they should play in the semi- final. As they were in the hardest group. This team did not not qualify, because they lost on goal difference (To Saint Marys). Qualified through the group stages, which they won. After this, they went on to win the semi-final and after that they went on to win the final! Champions! Congratulations must go to everyone, who supported each other. This is now the second time Primrose Lane have won in 42 years (but the second time in three years……we are getting better!). We’d also like to thank the adults who supported on the day (Mr Harper, Jacob Dunwell and Mr Camp. Thanks to the Parents/Carers support too. Ashlynne – I really enjoyed the swimming. I loved doing the cycling. I felt happy that I did it because in the morning I felt nervous but I did it and it was not scary! James – At the triathlon, the three stages were swimming, cycling and running. My favourite stage was the swimming section because when I got in the water was ice cold and since I was quite hot the water was lovely. However, my least favourite stage was the cycling because near the end of the first lap I kept on falling over but overall I enjoyed it. 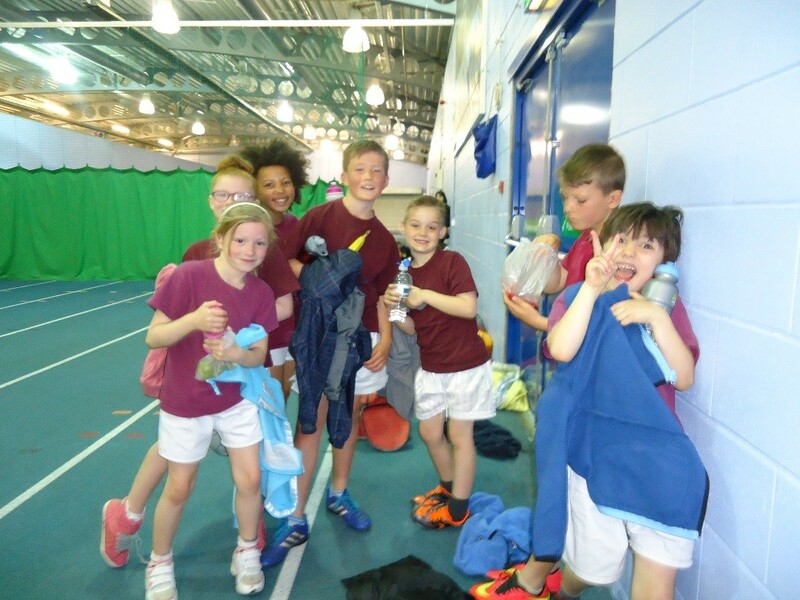 Anya – On Wednesday 8th June, Year 4 did a triathlon at John Smeaton Leisure Centre in Leeds. I enjoyed the swimming the most because I like swimming but I didn’t really like the cycling because you had to do it on grass. Harrison – I thought it was amazing because I got to do a triathlon. My favourite part was swimming because when you had finished the swim you quickly put your t-shirt on and ran to the cycling. It was brilliant! Jonathan – I enjoyed the bike bit and it inspired me to go to another triathlon. 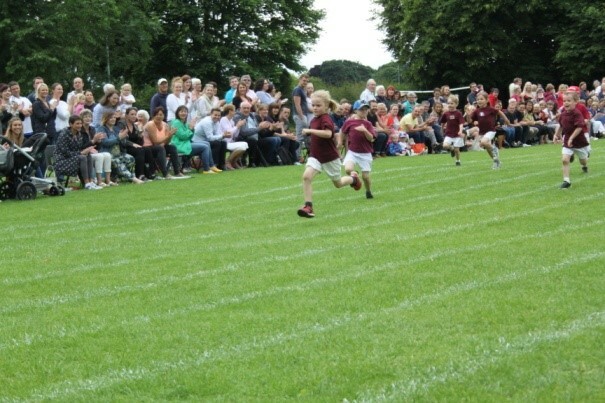 My favourite part was the running bit but I thought I did well and the whole class did well too. The swimming bit I found hard to do. I liked the photo bit with the trophy. 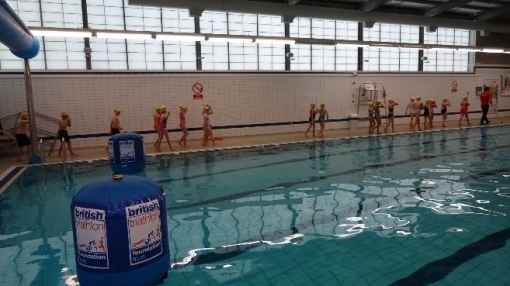 Edward – On Wednesday 8th June, Year 4 went to the John Smeaton Leisure Centre to do a mini triathlon. The 3 events are swimming, cycling and running, in that order. My favourite event was the swimming because there were 3 options to swim. I chose the longest swim because I’m a good swimmer. Maisy – I think the best part was when we swam in the swimming pool because I love swimming. My second favourite part was when we ran to the finish line because I felt really good when I finished. 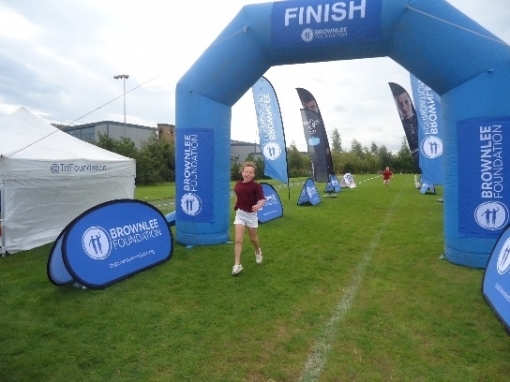 Imogen – On Wednesday we went to a triathlon, it was brilliant! I loved how supportive everyone was. First, we got a talk on what to do and the staff handed out swimming hats to wear, they looked ridiculous! But I was glad of mine. After the talk we got into the pool, it was a cold but I forgot about it when I started swimming. We also did running and cycling, it was tiring but I enjoyed it. We had a class photo, it was great! 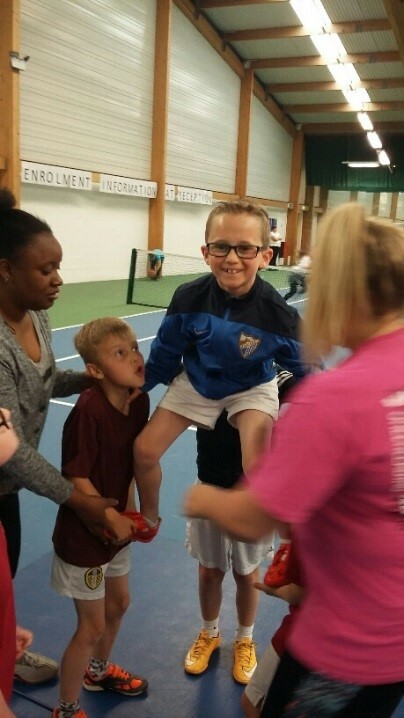 Ethan – I really loved the triathlon because I got to try something new instead of playing football. My favourite part was the cycling because I got to get my breath back from the swimming. But I also enjoyed the run because it was really easy and after the run we got to eat and have a drink. After that we took a picture of us with the trophy and we all got our own medal! Evie – Today I went to a triathlon and it was so fun. When I finished swimming we didn’t dry off with a towel so I just put on my t-shirt, no socks and my trainers. Luckily, it wasn’t cold. After I had cycled twice around the field everyone cheered me on when I arrived at the end. Overall I really enjoyed it and I thought it was a really good experience! 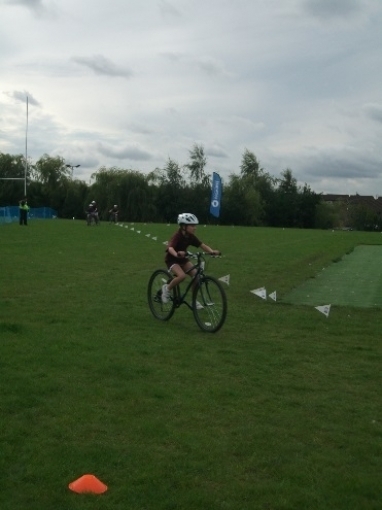 Elyssia – On Wednesday, Year 4 went to a triathlon in Leeds and the events were swimming, cycling and running. The Brownlee brothers couldn’t be there so they sent us a video saying good luck. There were lots of different schools there. 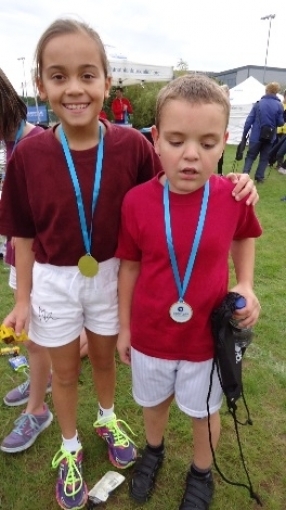 Jamie – We took part in a triathlon. I enjoyed the swimming. I enjoyed every single moment of the triathlon. Swimming: 10/10 cycling: 10/10 running: 8/10. I would like to go back! As you may be aware, last Friday turned out to be a great success! 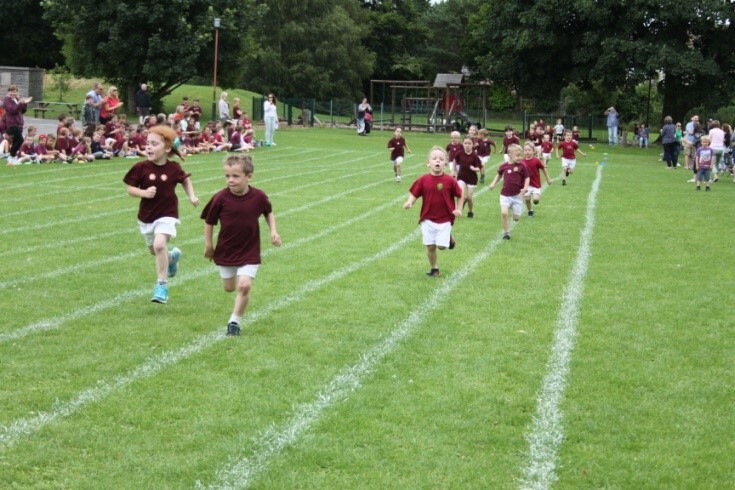 All children, from Nursery to Year 6 joined in the fun run, and we were extremely impressed with the effort put in regarding the number of laps children tried to complete, as well as the behaviour. 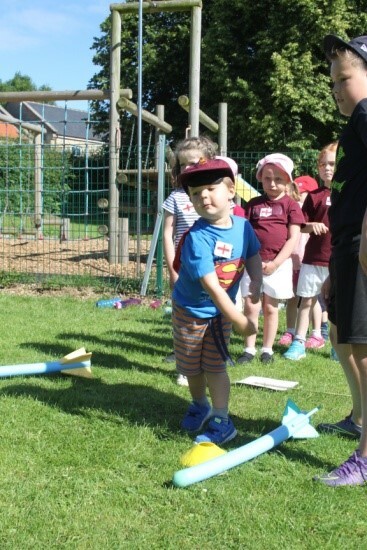 I’m sure you’ll agree that children expressed a wonderful attitude, to what was a challenging task, as well as representing the school excellently. 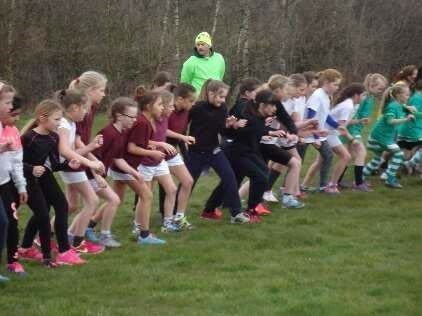 The whole morning ran smoothly, from the children, right through to the marshals and volunteers that helped. School Sports Leaders would like to express their appreciation to all who took part, all who helped and all who have begun raising money for the school. If money raised could be returned by Friday 1st July 2016, that would be great. This will all go towards equipment for school and the children of Primrose Lane. Awards were also given out for Mrs McTaggart, Miss Gregory and Mr Simpson for their efforts at running. 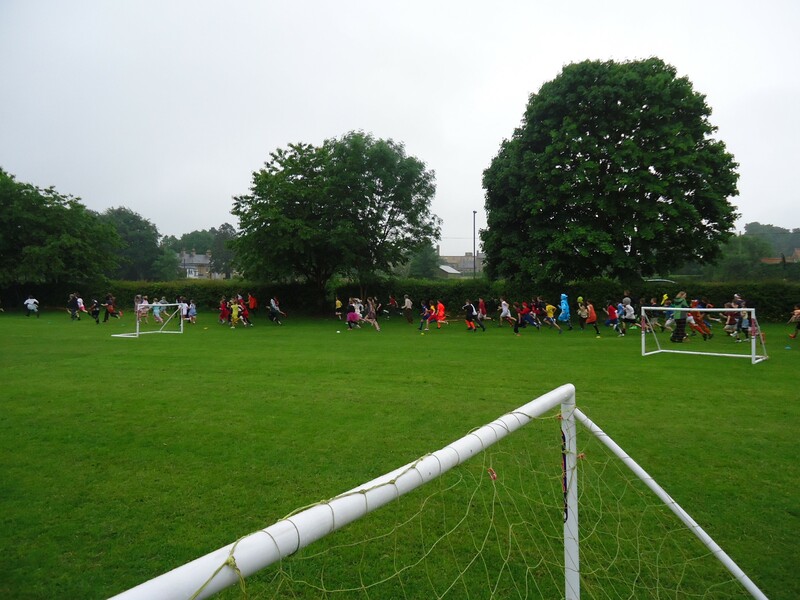 Many thanks again to those adults who marshalled in the pouring rain; let’s hope next year is as good a success! School Sports Leaders and Mr Jackson. 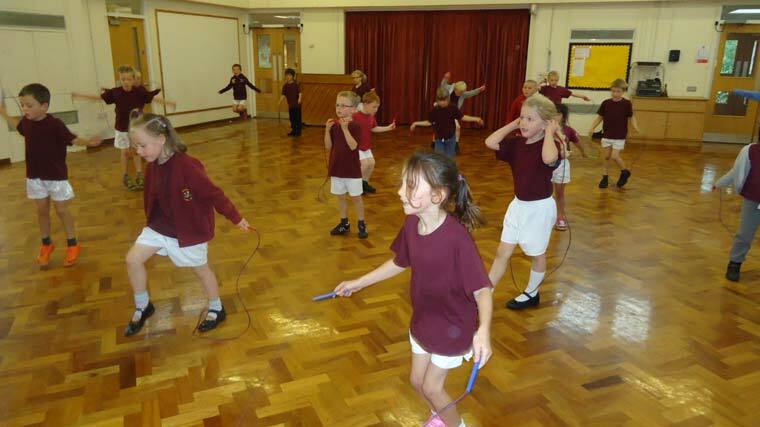 Harry – ‘The skipping rope whistled!’. as the rope goes under your feet’. Sam A: ‘I learnt that you bounce on the balls of your feet’. 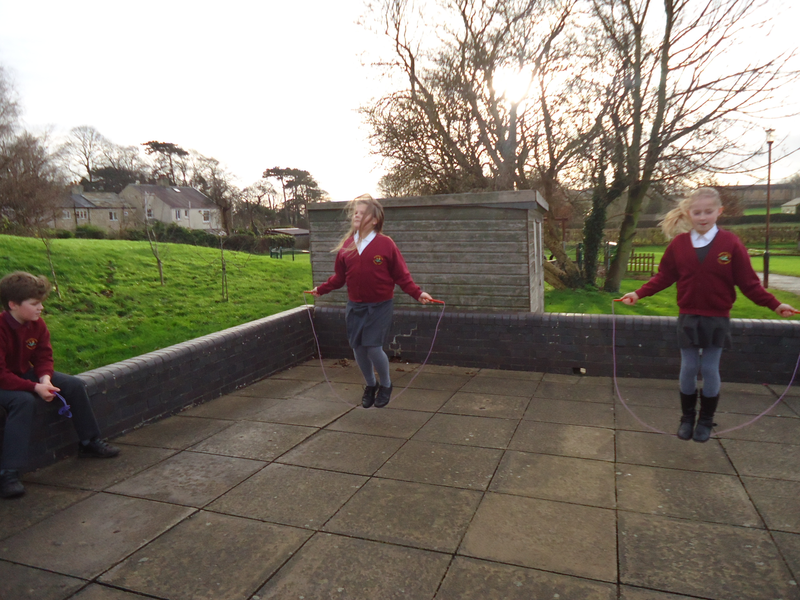 Beth: ‘I learnt to hop and skip at the same time’. 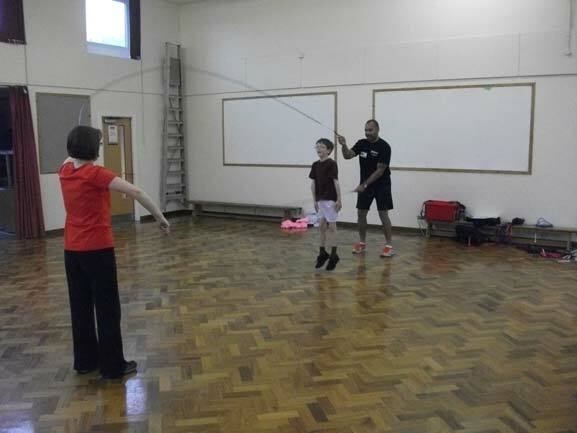 Edward: ‘I learnt that when you are skipping Double Dutch you can twirl around’. 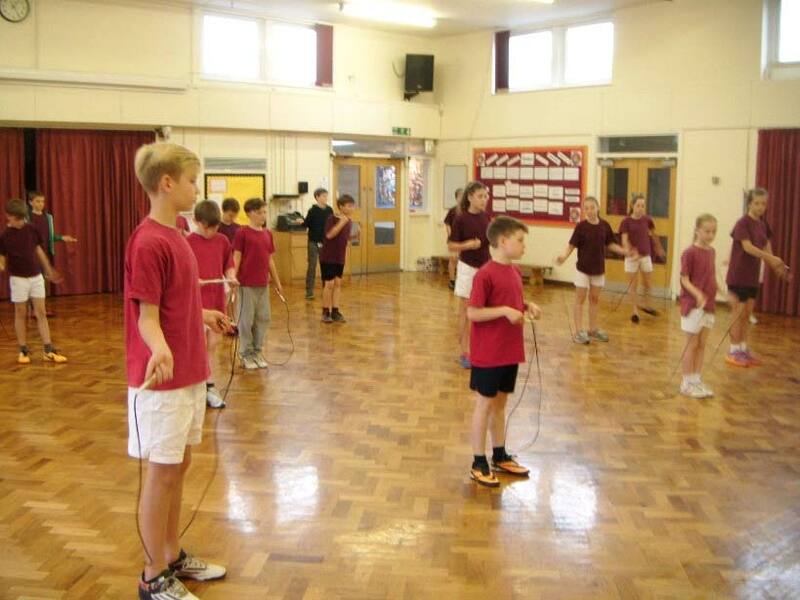 Will: ‘I liked the skipping but it was incredibly hard’. 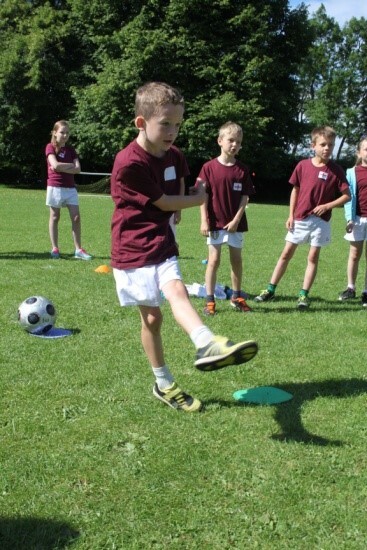 Christian: ‘I loved skipping and improving my skills’. 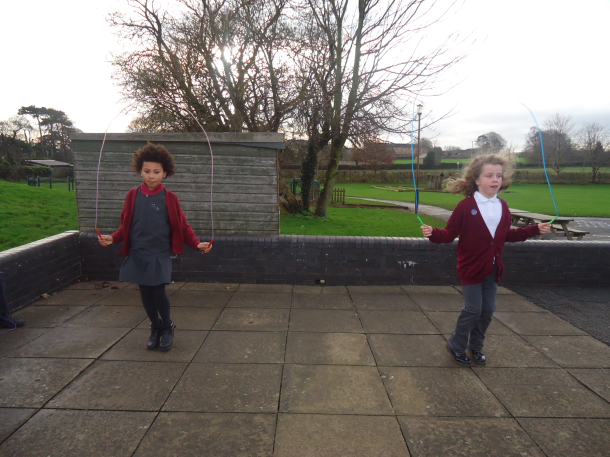 Lucy: ‘The skipping was quite hard and it gave me a challenge with the Pretzel’. 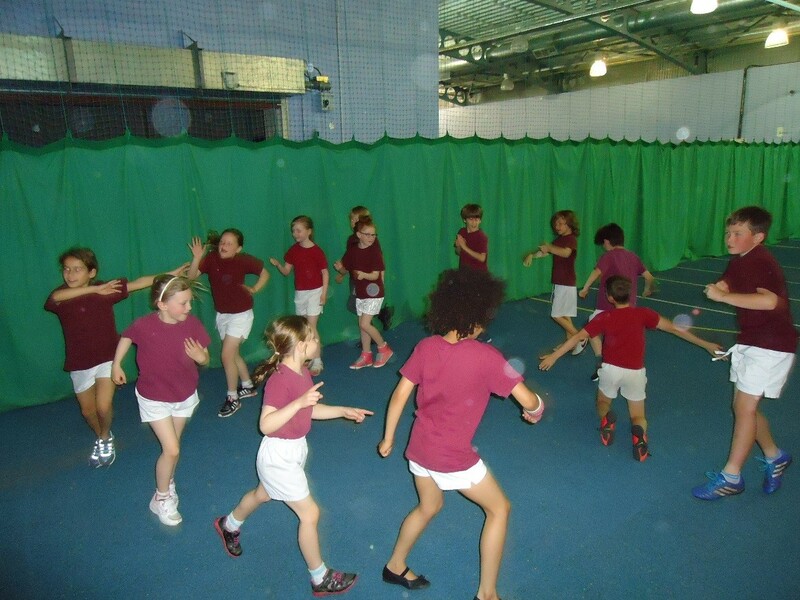 Year 3 had an action packed morning at the John Charles Centre for Sport on Wednesday 25th May. 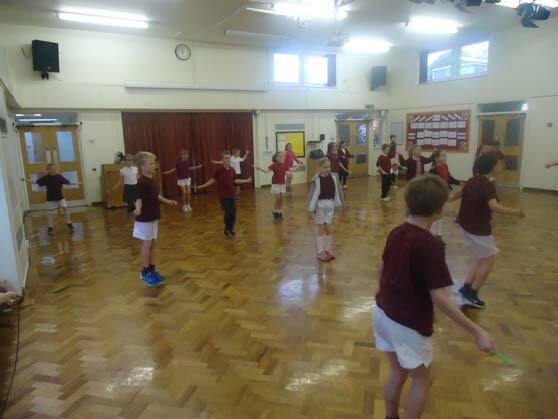 They had the opportunity to try out a variety of different sports which ranged from cricket and hockey to samba and cheerleading! 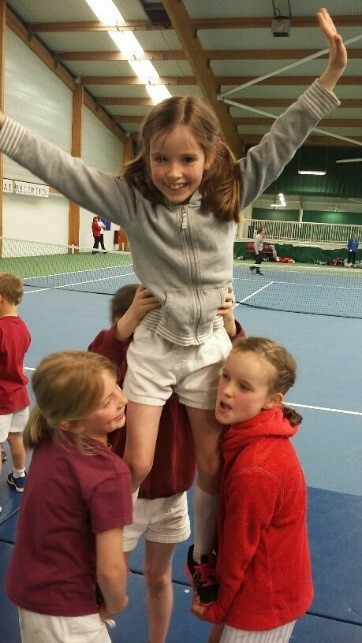 Imogen Georgina and Harvey loved being flyers in cheerleading. 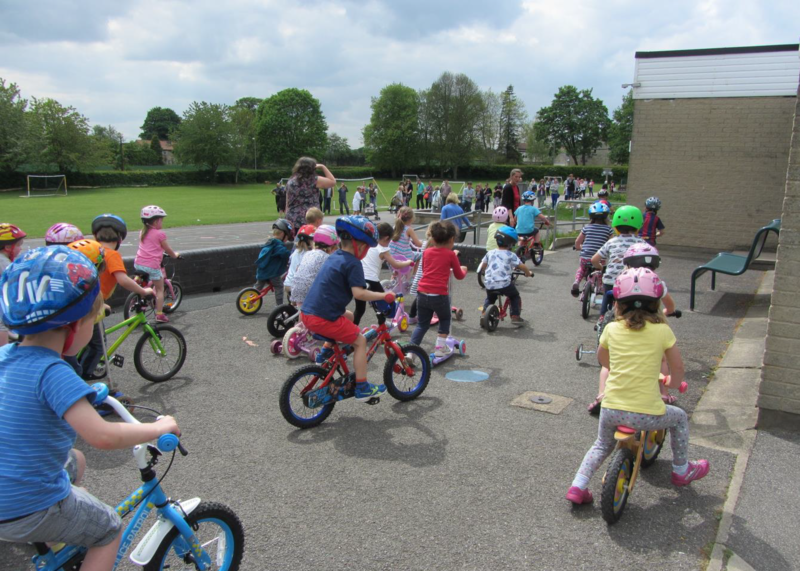 “On Tuesday the Nursery children participated in their own Tour de Primrose and the day was a brilliant success! In the morning the children were each treated to an exciting chariot ride around the playground by two mums who very kindly offered their services to the day’s events. 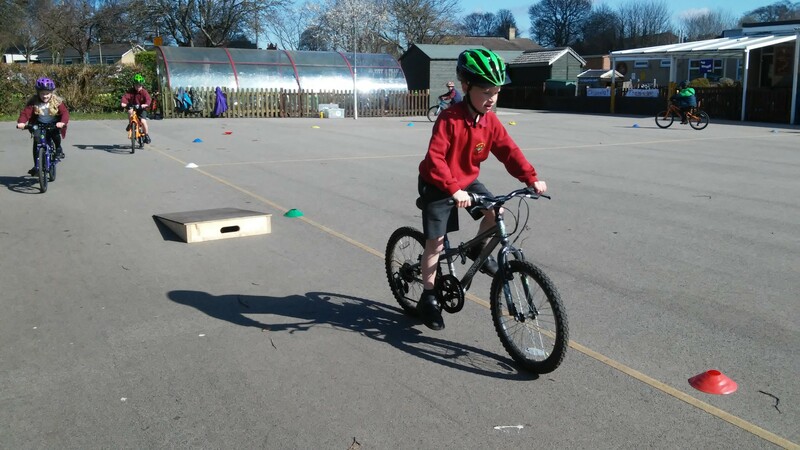 Next the children participated in group races where they sped across the playground on their bikes or scooters trying to win the race, and afterwards they each tackled the tricky obstacle course. After a picnic for lunch the children were feeling rested and raring to go for the day’s big event – Tour de Primrose! 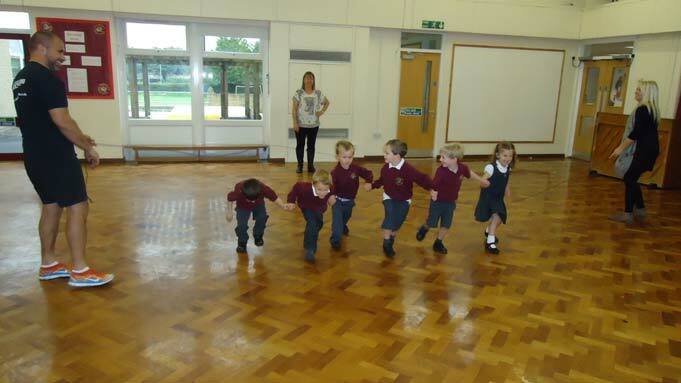 The children opened the race with the wonderful songs they have spent lots of time learning, and then they were off! They sped across the playground to the different stages of the race, peddling as fast as they could and trying to negotiate their way along the difficult route. During the race the children stopped for a quick break to refuel with energy bars and water. After a final sprint to the finish line the children were exhausted and ready to relax with their family and friends. They enjoyed homemade afternoon tea in the sunshine, sat underneath the fluttering Tour de Primrose bunting. 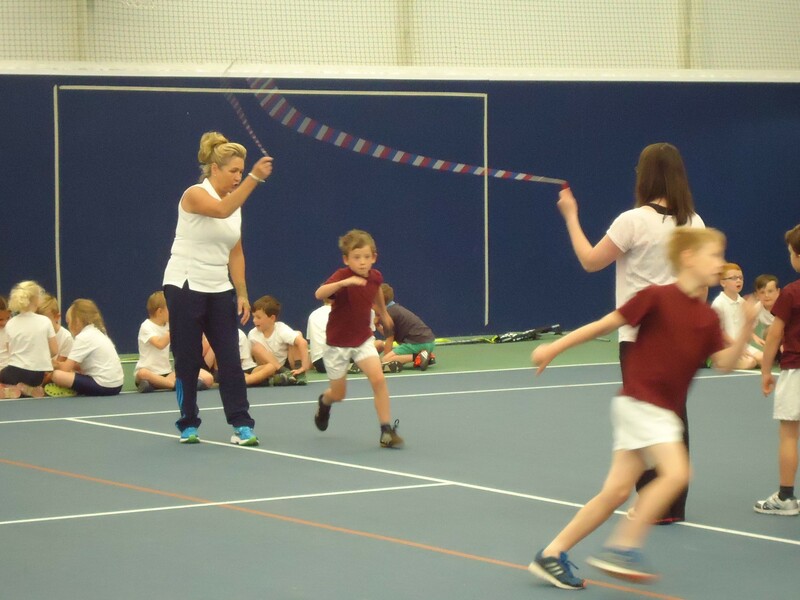 The children showed great skill and determination throughout the day, they listened carefully to instructions and participated fully in the day’s activities. The children also showed great skill and knowledge during preparation for the event in designing tickets, deciding the route and making the energy bars after discussing what ingredients we should put in them. 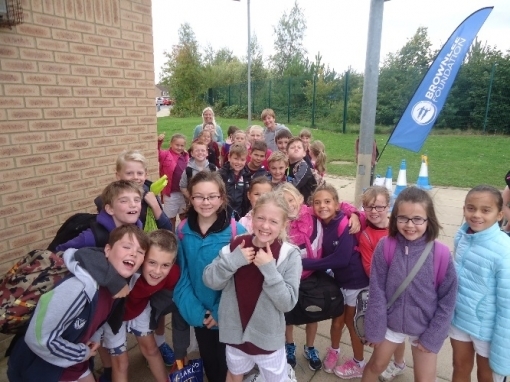 On Wednesday 23rd September 2015, all of Year 5 enjoyed a thrilling morning at John Smeaton Academy at the Active Schools Brownlee Triathlon event. The children arrived, equipped ready for an unforgettable experience, which began with a 30m swim, followed by a 300m run and 1km cycle. 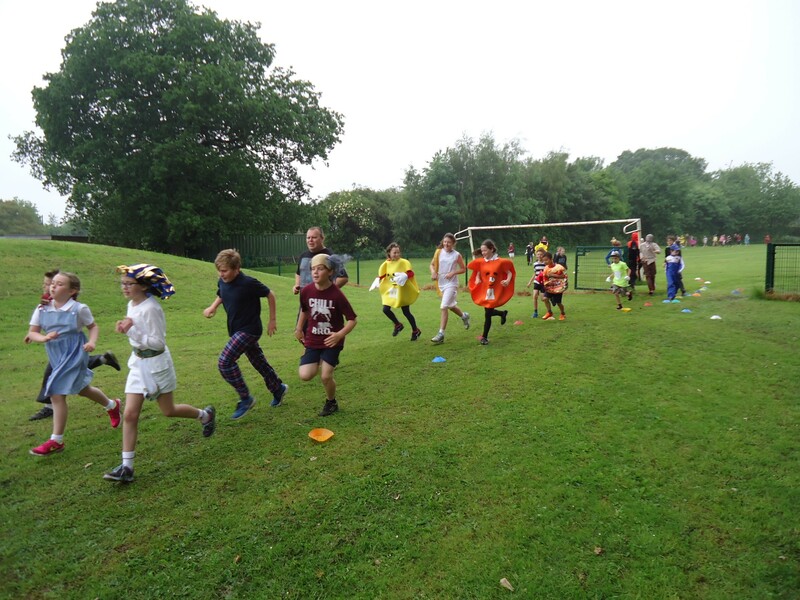 Despite this initial shock, the whole of Year 5 thrived on the experience and went with it, all completing the stages and achieving a medal and goody bag. Upon completion of the course the children were delighted to be greeted by our very own British athlete Alistair Brownlee! He was surrounded by the class wanting autographs and photographs with him and the children were inspired by what he'd achieved. He even commented on the class, saying how well behaved they were and that he was privileged to be part of the event. 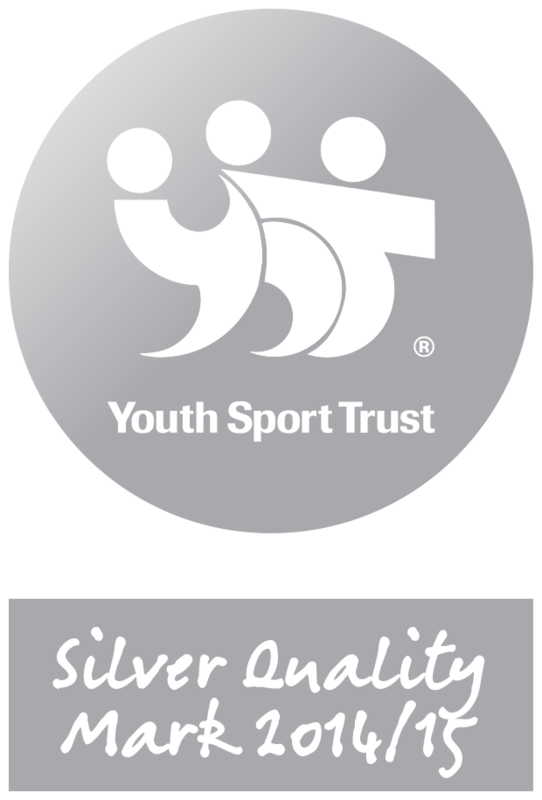 Heath- 'I really enjoyed the triathlon because I wouldn't have got that experience. It was just like a real one, because we had to swim 30 metres, then get out of the pool and put our PE kit on over our wet things. Edward- 'At the end we were presented with our gold medals by Alistair Brownlee, as well as a goodie-bag. I liked getting my medal signed by Alistair. Very well done to Year 5 and thank you to Mr Jackson and all the other adults who accompanied the children. 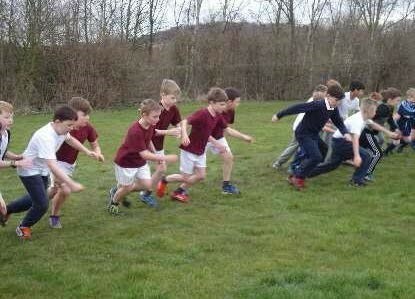 On the 8th March, ten Year 5 children participated in a cross country competition on a marshy field at Brigshaw High School. We competed against approximately 40 people, boys in one race, and girls in the other. The whole team ran extremely well, even though the field was very wet and muddy (which made it hard to run). The reason we did well was because we paced ourselves at the start of the race, so we could sprint at the end. We were all very proud of the places we came in and cheered each other on as we tried extremely hard to complete the course! We were all exhausted after we finished the race, because we had to do the extra-long course! When the results came through, the girls had got through to the final but, unfortunately the boys did not. 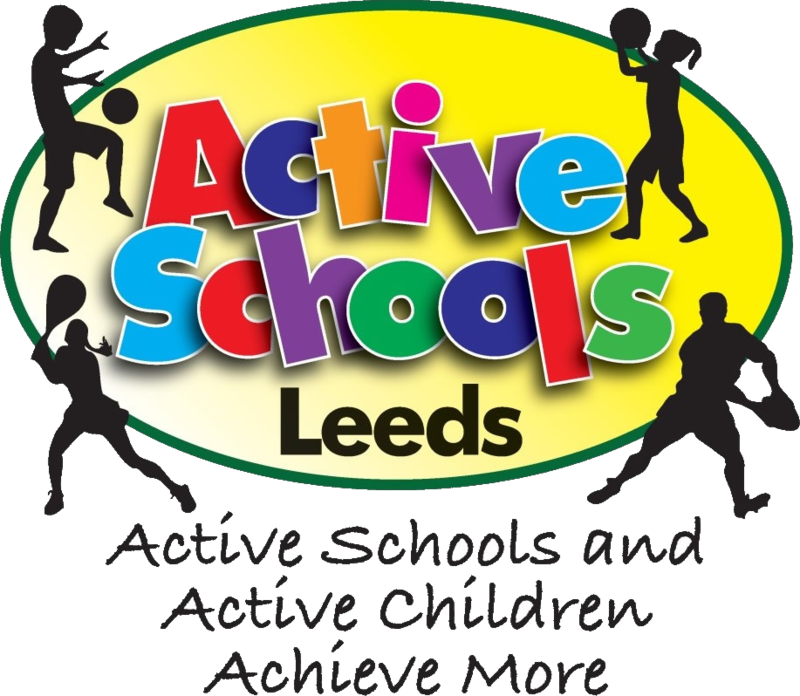 The final is on the 12th March at Leeds Beckett University but unfortunately we all have other commitments with physical activity, so cannot compete. Thank you to Mrs Watson and Miss Billson for helping out on the day. 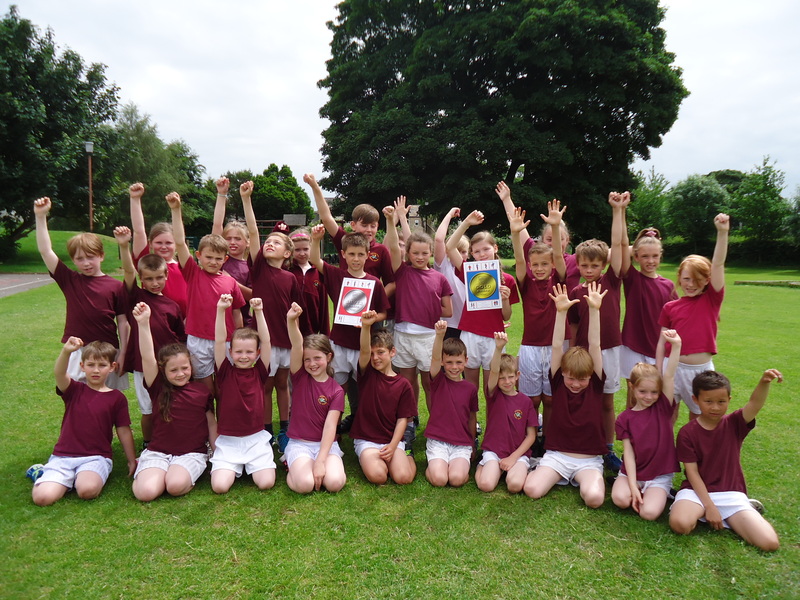 “On the 18th May, we went to an amazing skipping competition! It was amazing we felt so excited! On the way there it poured with rain so we got absolutely soaked . . . but it was worth it! When we arrived the hall seemed MASSIVE! We went through our fabulous dance before other schools started arriving and the tension got bigger! We did a warm up and sat in our corner and watched the fast skippers jump over their ropes (you could hear the swooshing sound!). 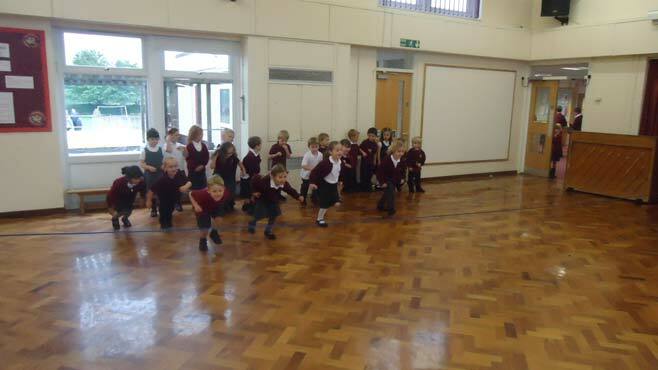 Then the moment came to do our amazing, fabulous skip dance. We felt nervous and incredibly excited! As we were dancing we couldn’t help ourselves from smiling it was so fun. We loved it! We cheered for the other schools even though we wanted to win; we’d say we were good sports. Then they started giving out certificates. We were feeling nervous and excited. Then the moment arrived to see if we had won our event ‘face to face’ and we came . . . 1 st! 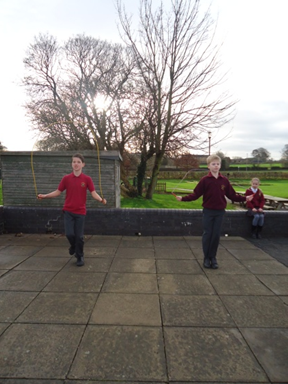 Then the big BIG moment arrived to see who had won the overall skipping competition and we came . . . . 1 st! We were over the moon! We shouted, "We won!” It was the best school day EVER!!! 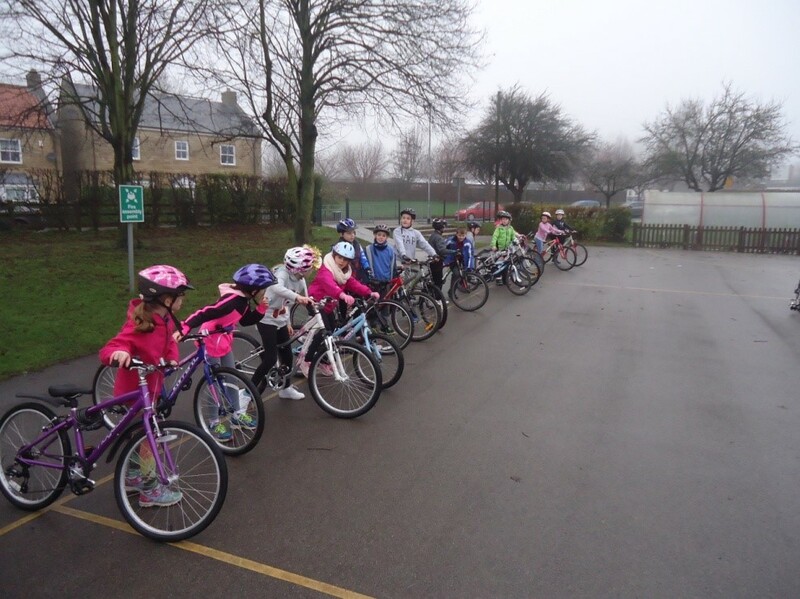 On Monday 14th December 2015, most of Year 5 did a Bikeability ride, which involved children riding on the roads, signalling and following safely. Before they departed, they had to do their vital ‘M-check’ on their own bikes, as well as ensure they could demonstrate riding safely. They started from school, up Westwood Way to the high street, over the bridge to Thorpe Arch onto Dowkell Lane towards Wealsun Prison, onto Route 66 Cycle Path , crossing over Walton Road and passed Wetherby Racecourse and riding alongside A1M on the bridleway . Back down towards the River Wharfe and then along passed the Rugby Club and towards Wattlesykes roundabout rejoining the Cycle Route and up to the Boston Spa School back to Primrose Lane. 8.72miles in total. Ben K- ‘I enjoyed getting tips from the instructor (Angela), even though I fell off my bike a few times!’. We would all like to say thankyou to Angela Gaunt and her team for the experience. 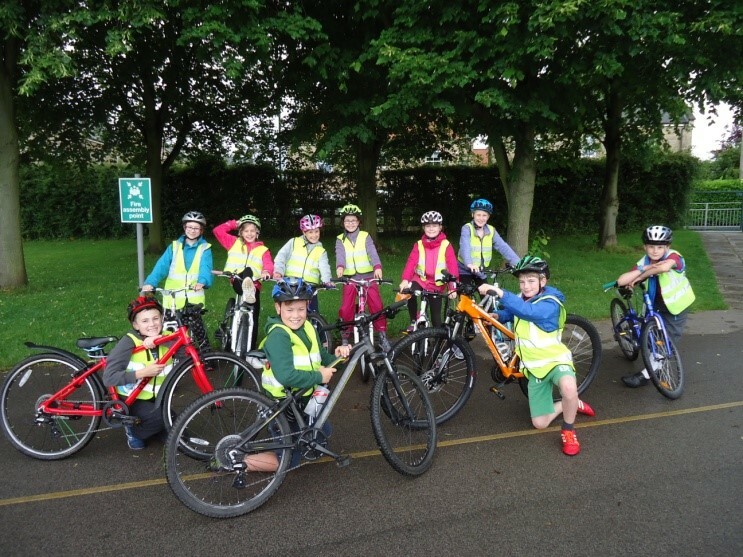 During the last week of the term Year Two enjoyed four sessions of Bikeability with Cycle Leeds. 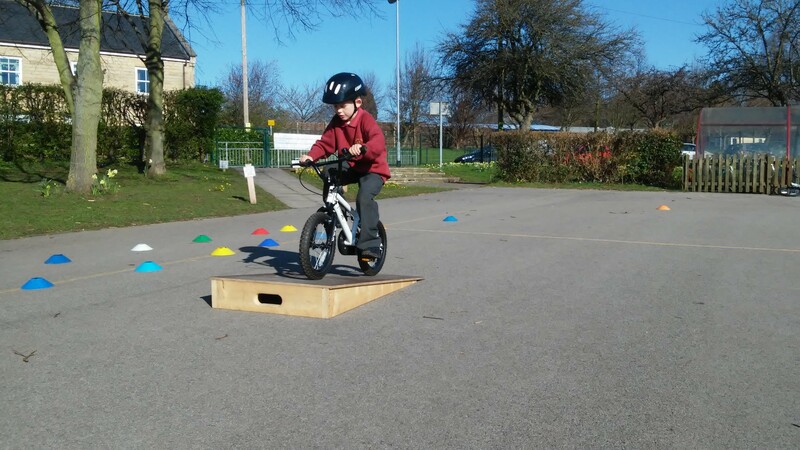 On the first day, they had fun using the balance bikes and practising some of their skills and on days two and three, they developed their skills further including using ramps. 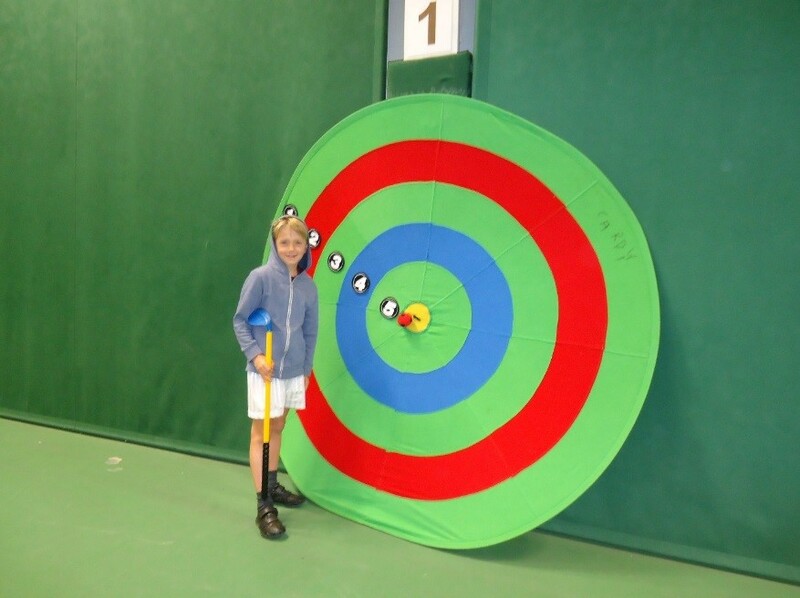 All the children were superbly behaved and really enjoyed their sessions. 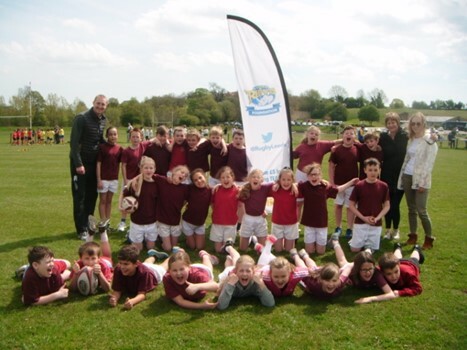 On Wednesday 24th Feb, 10 of our Year 6 pupils were very fortunate to take part in a Gaelic Football Festival held at Boston Spa School. 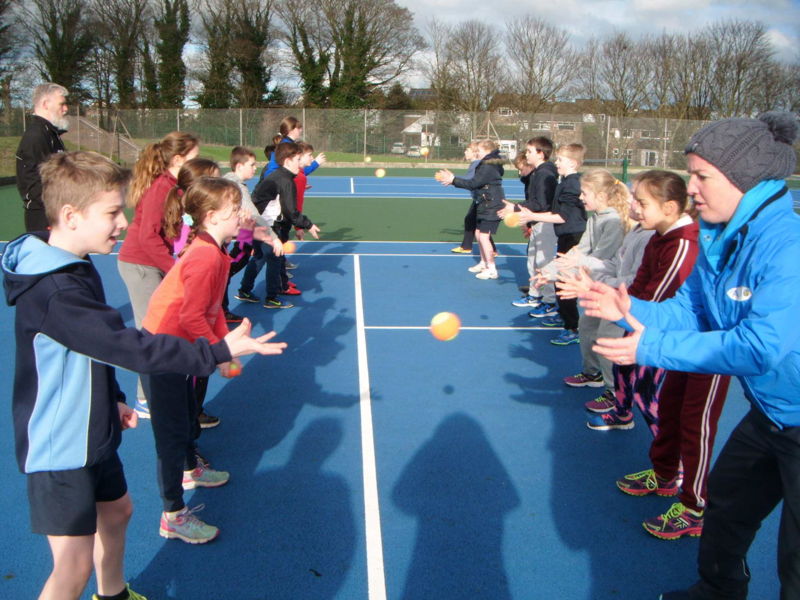 The children were introduced by Mr Mc Keogh to this skilful, enjoyable game before embarking on a training session led by Boston Spa pupils and coach Mr Lynsky. The afternoon progressed to a full game being played in mixed local teams involving St Mary’s and Lady Hastings. Our children are very much looking forward to putting their newly acquired skills to the test by representing Primrose Lane in the proposed Gaelic Football Tournament, date to be confirmed. 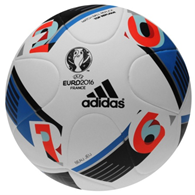 I found the Gaelic Football really fun, because it was a new sport that hardly anyone knew about. 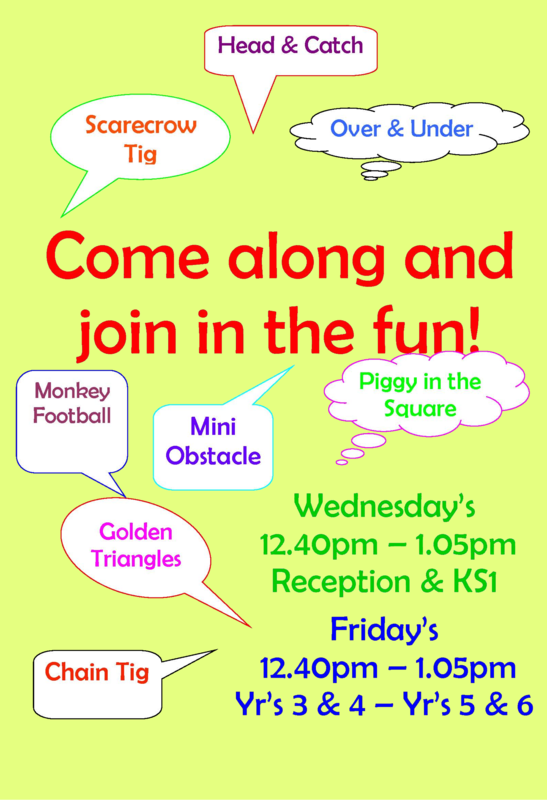 I thought it might be a little bit like football and I have lots of fun playing it at playtime. At first we had to learn how to pass the ball, kick it back up to your hands, and dribble it. There was only a small part of it when you needed to kick, most of it was with the ball in your hands. I got chosen to be defender at first, my goal was behind me and two other people who were on the opponents team, were the scorers, the midfield people had to pass it to them and then they had to score. But I had to tackle them by just batting it out of their hands, or snatching it off them whilst running. We all got a chance in different positions, which were; goal, defend, midfield and scorer. Overall, everyone had lots of fun and it was maybe even a tiny bit better than normal football, in my opinion. 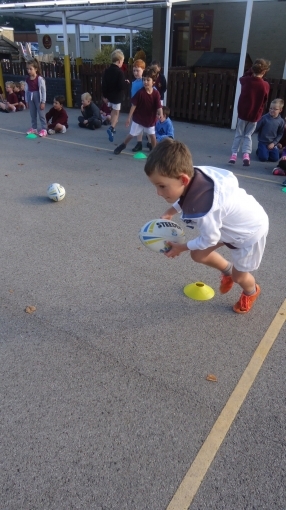 Since the start of the term Year 2 have been training with the Leeds Rhinos coaches every Friday morning. The sessions have focussed on core skills such as agility and throwing and catching. 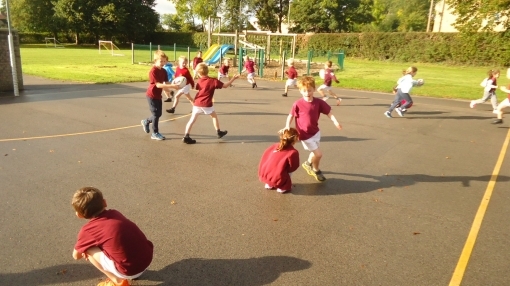 The class have thoroughly enjoyed playing a range of different 'tag' games from scarecrow tig, wizard tig and toilet tig to rugby tig. Through these games they have learnt to be quick on their feet, change direction and find space. 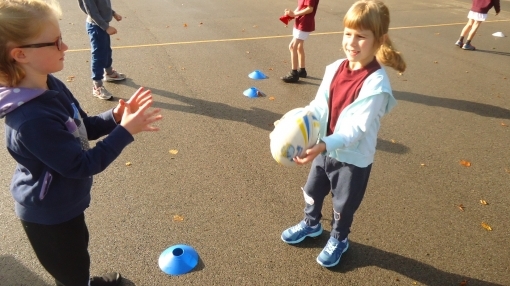 They have also been learning how to hold a rugby ball correctly, how to run with it and how to throw and catch it while keeping it in control. 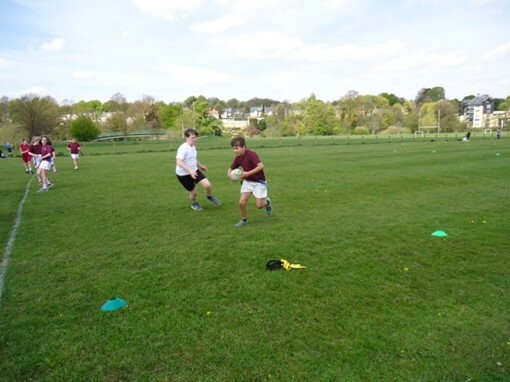 The class have really impressed me with their enthusiasm and determination; I look forward to doing some more rugby later in the year. 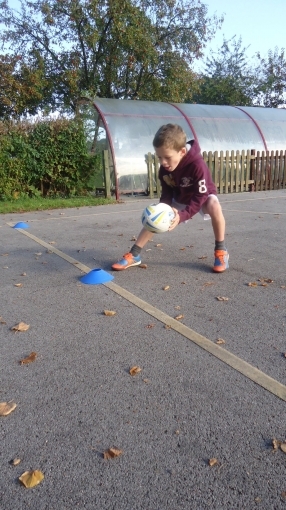 Sam D - I enjoyed playing rugby tig because it was quite hard. 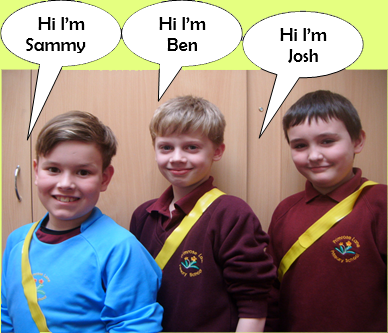 Benjamin - I enjoyed rugby because we played lots of different games and it was fun. 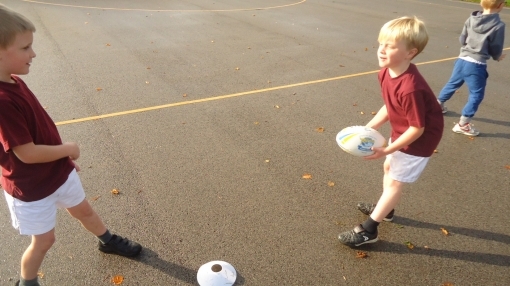 Edward - I enjoyed playing rugby tig. 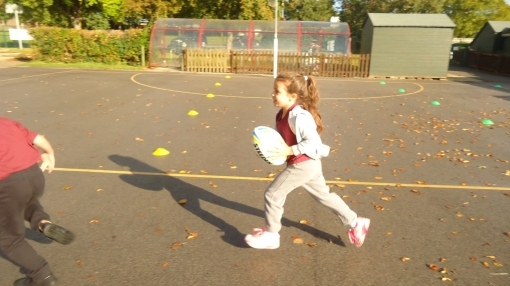 Beth - I enjoyed learning how to hold the rugby ball because I didn't know how to do it before. 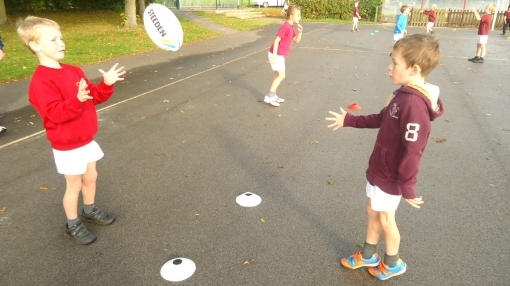 Bobby - I liked rugby tig because it was good to use your agility and it is a really cool game. Charlotte - I learnt that you need to hold the ball on its tummy not on its ears. Cian - I have learnt how to do a tumble pass. 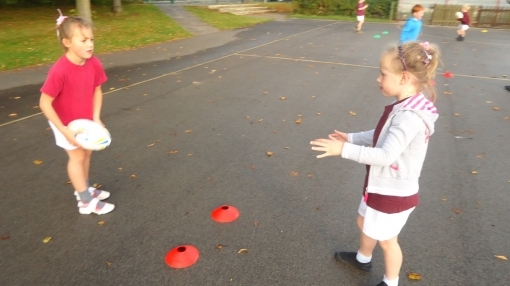 Wilson - I learnt that agility is important because if you are going at full speed and someone was coming straight at you you can move to the left or right. 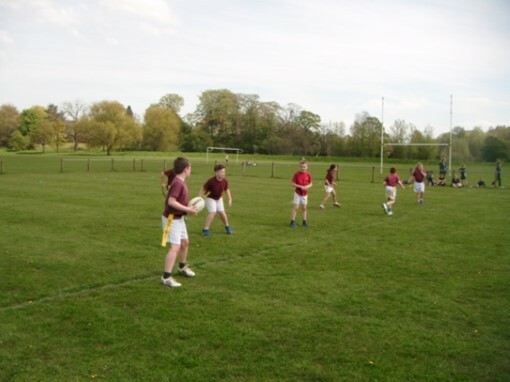 Matthew - I liked rugby tig because you had a partner and it was great fun. 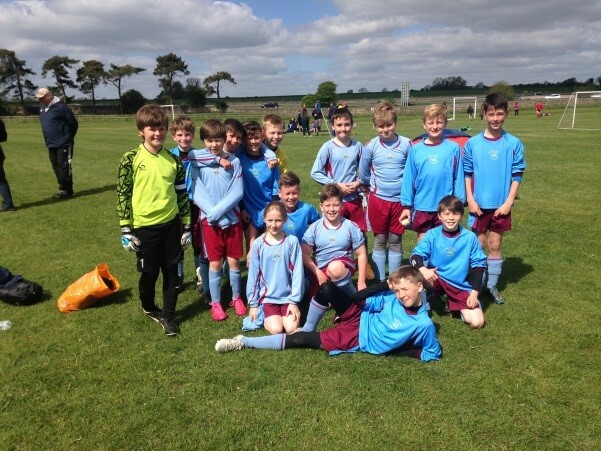 On Saturday 14th May 2016, Primrose Lane participated in the Wetherby Schools Tournament that was held at Grange Park Sports Club, Years 2, 4, 5 and 6 all fielded teams. 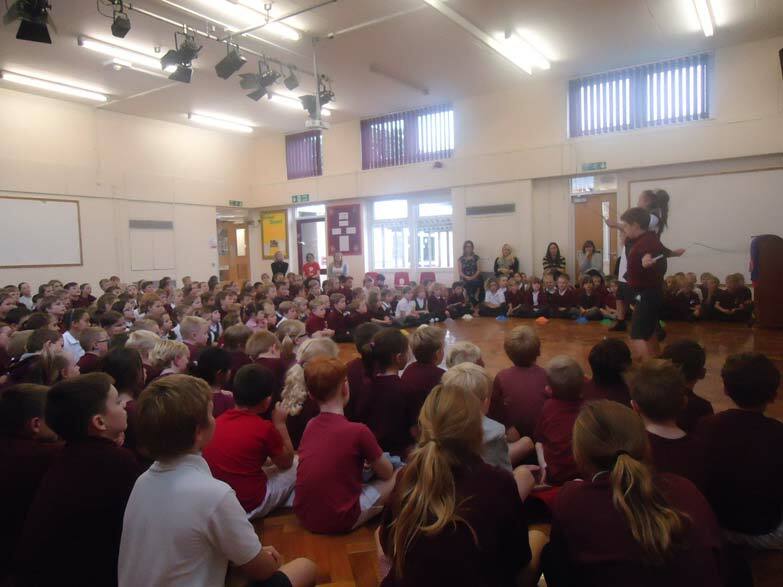 All the children behaved impeccably and were shining ambassadors for our school. 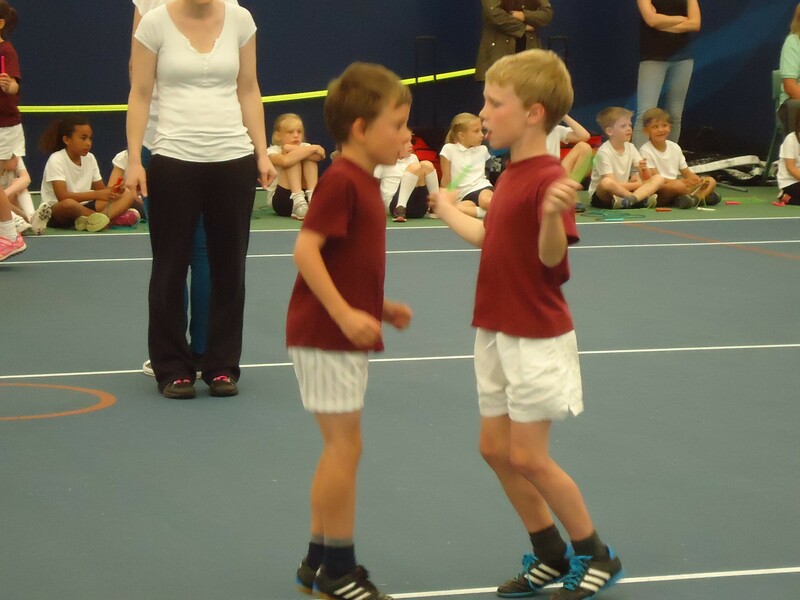 They all demonstrated the values that we feel are important; sportsmanship, quality, co-operation and perseverance. 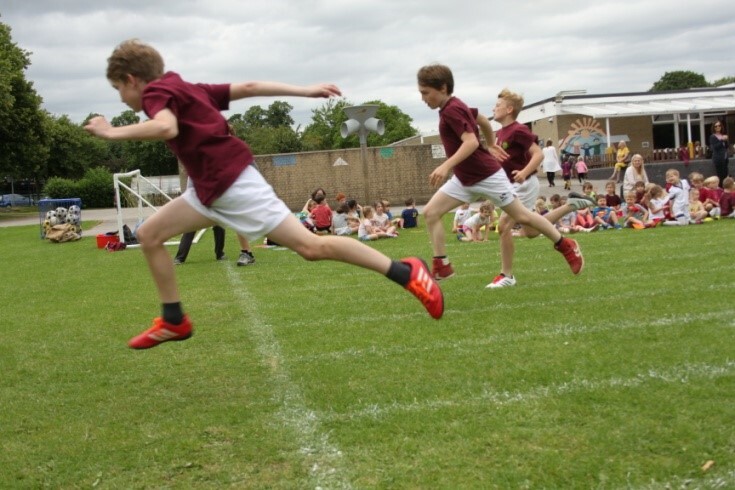 The Year 2 tournament was non-competitive; however no-one seemed to have mentioned this fact to them, as they were determined to win every ball and score as many goals as possible. 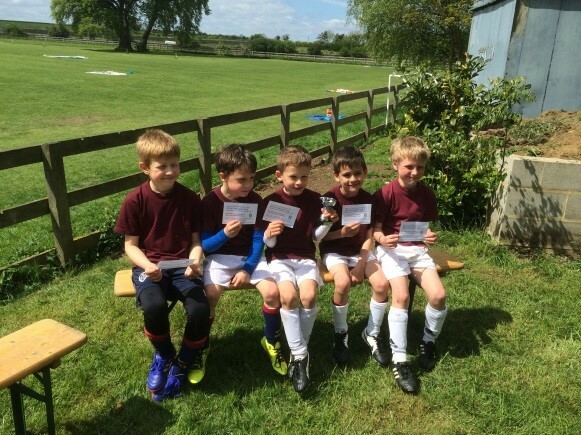 Year 2 played in 5 matches, during which they didn’t concede a goal, winning 4 games and drawing 1. 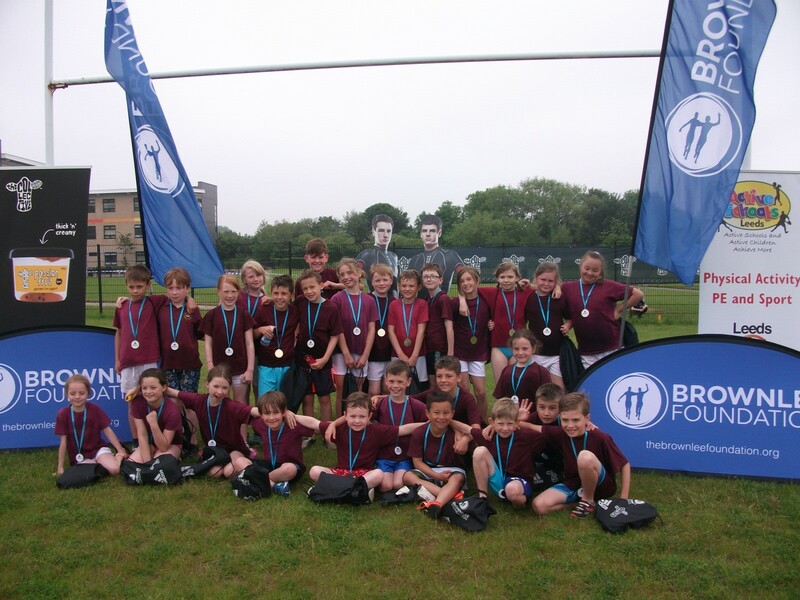 The Year 4 tournament was very competitive, with the team running for every ball and tackle. All the team were encouraging each other and working hard on closing down the opposition quickly. Their attacking players ran past the defence like seasoned professionals and the defence were a solid wall, preventing the opposition from scoring until the final match. The final was a very hard fought game against St Edwards, but again the team played like heroes ending the first half 2-1 up. During the second half the result never looked in doubt with the final result being 3-1. Years 5/6 played with a lot of heart, unfortunately it was not their day. Both teams had their inspirational moments, and they all played with determination. Lucy Kemp shocked many of the opposition with her solid tackling. Unfortunately they were knocked out before the semi-finals. All children in Year 5 all represented the school brilliantly and behaved very well, even when decisions didn’t go their way. Everybody showed excellent gamesmanship by shaking hands and wishing each other the best for the next game. 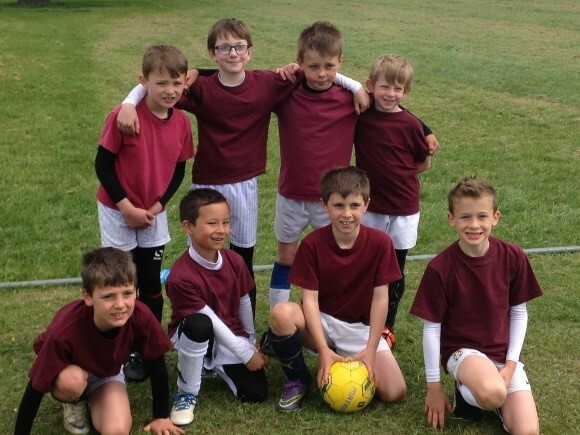 Primrose A team did amazingly well, winning most of their games and therefore got through to the quarter-finals. Unfortunately they lost 2-1 in the quarter finals to Collingham A Team. Unfortunately, Primrose Lane B and C teams didn’t make it through, but scored some great tries, as well as got better in each game (which they enjoyed!). 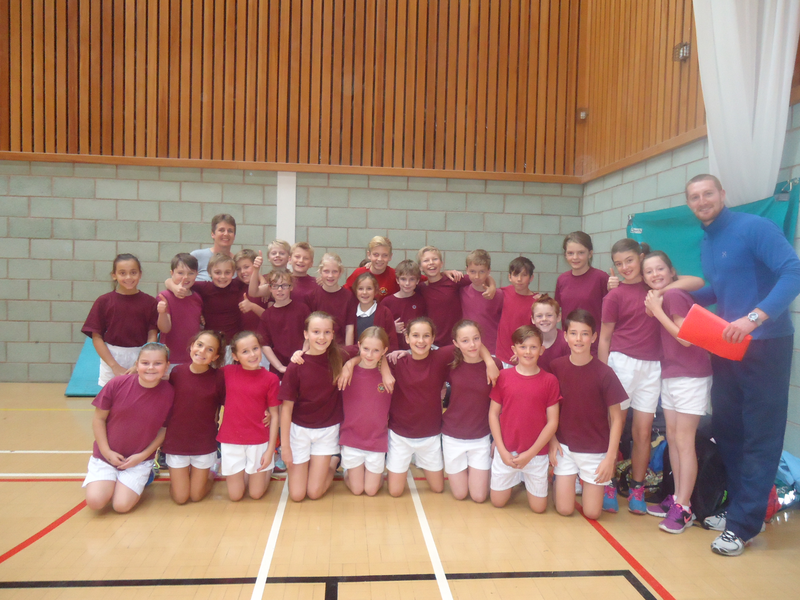 Athletics Competition, October 2015 Years 5-6: WINNERS! 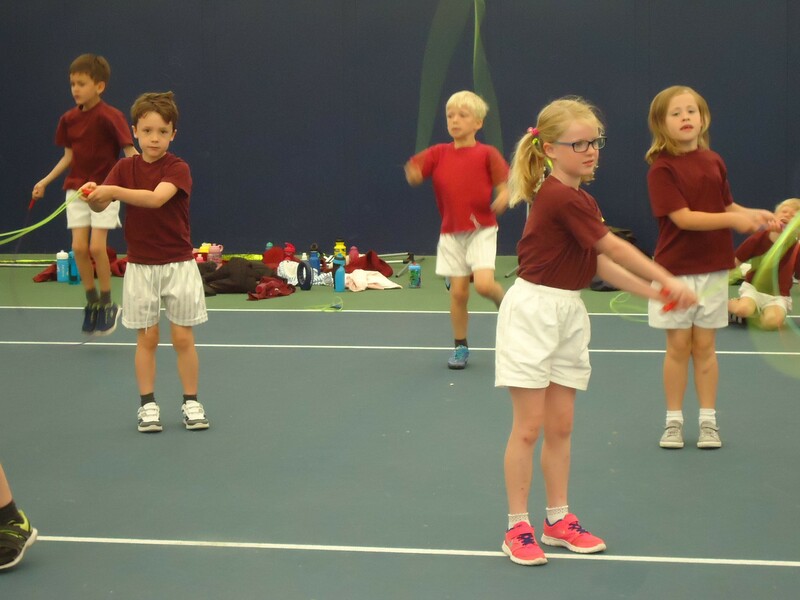 On Wednesday 20th October 2015, pupils from Years 5 and 6 represented the school and competed against five other schools (). 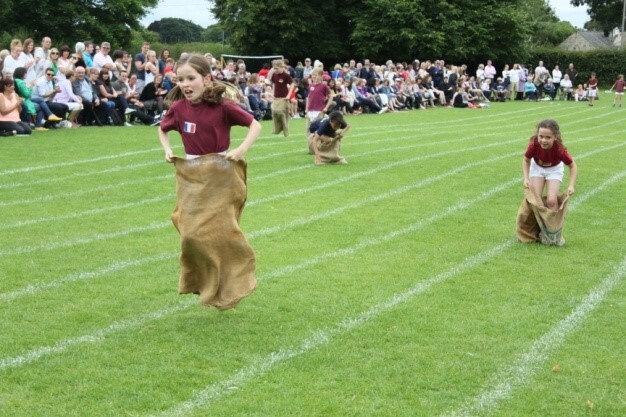 The events involved girls competing against each other and the boys competing against each other, then the results combined to give an overall score. The team did exceptionally well and behaved impeccably, resulting in WINNING and moving through to the City Cup! 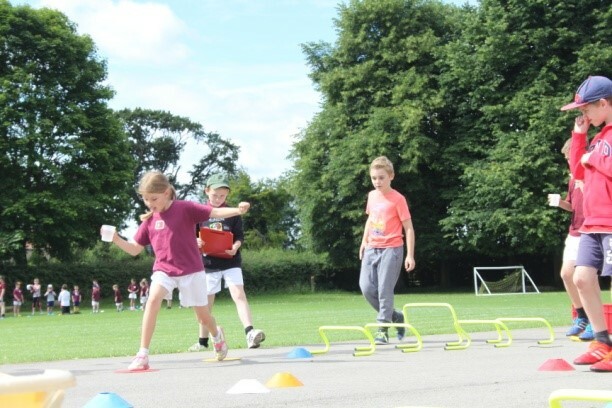 The events that the children competed in were individual races (along with hurdles), relay races (again with hurdles also), obstacle relays, standing long jump, standing triple jump, speed bounce, chest push, vertical jump and bull-nosed javelin. Congratulations to the whole team and good luck in the City Cup! 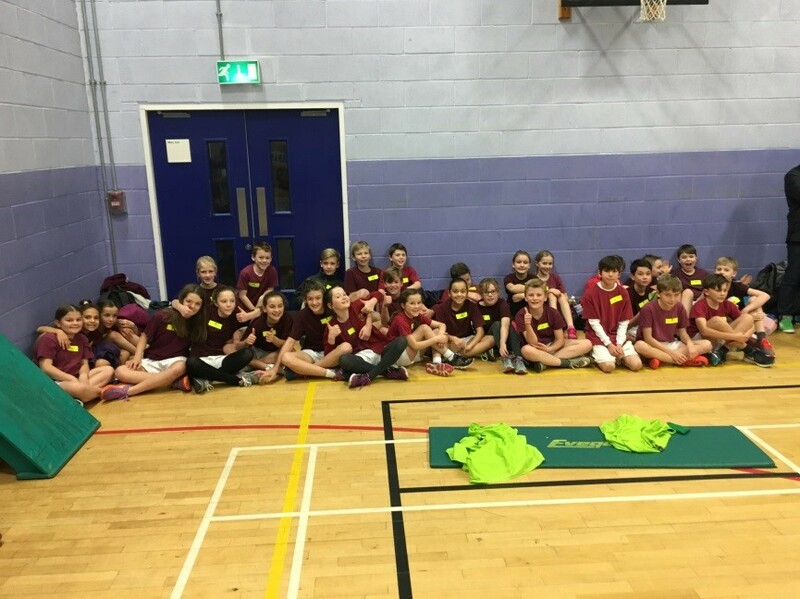 On Thursday 3rd December 2015, Primrose Lane competed in the semi-finals of the athletics competition after the success of last half terms first round. 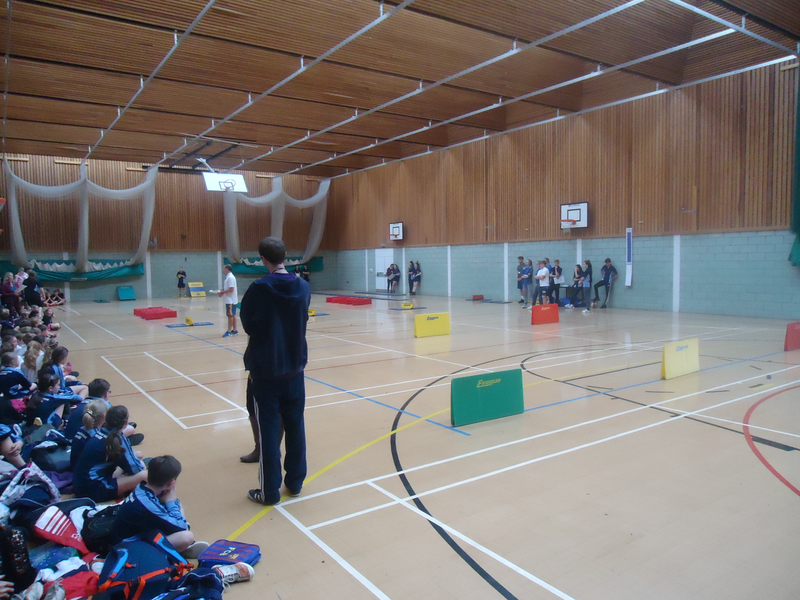 It was held at John Smeaton Academy High School in the sports hall. 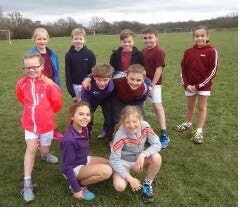 We competed against schools from: Green Lane, Methley, Beechwood and Colton. 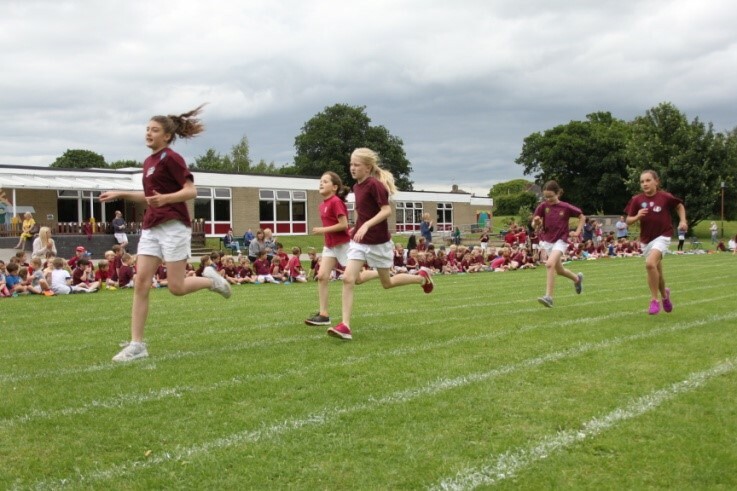 Altogether we competed well and achieved some great results, many of which were outright winners! Overall, we achieved third place out of the five schools, narrowly missing out to get into the finals by four points! Although this was the case, children enjoyed their time and were very tired at the end! Years 5 and 6 Boys- Jacob, Christian, Ben, Hugh, Daniel T, Matthew F, Sam C, Max, Edward, Oliver, Ben S, Ben K, Sammy H, Archie R and Heath. 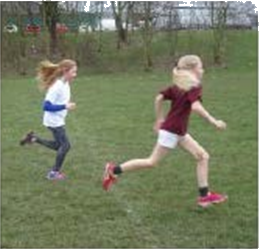 Girls forwards, backwards, sideways competition: Lucy v Lily(Girls winner – Lily). 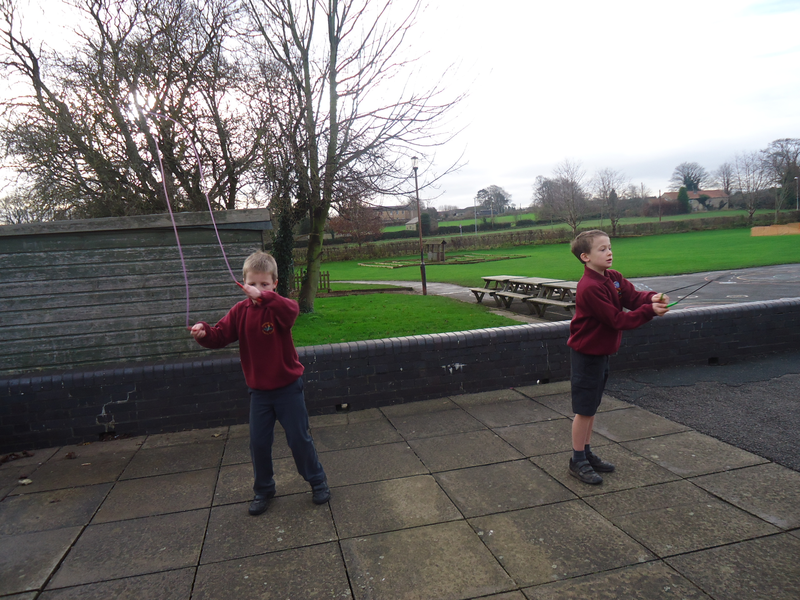 Commando Fitness is a lunchtime club that children from years 3, 4, 5 have been taking part in since September. The aim of the club is to improve the overall fitness and stamina of all those that participate, as well as to encourage team work. Those that take part learn that to improve fitness requires commitment and determination. 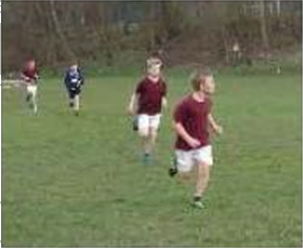 The exercises are varied and include running, tyre runs, log carries, press-ups and sit-ups and many more. All the recruits have realised that there is an added bonus to their participation, which is the chance to roll around in mud with adult permission! 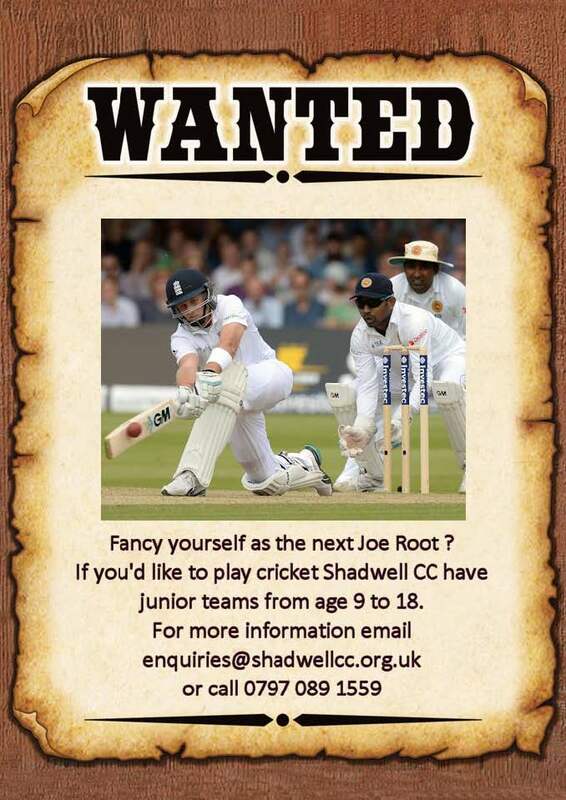 Scientists have proved that mud has youth sustaining properties, so any members of staff wishing to test the theory please feel free to come along and try it for yourselves.